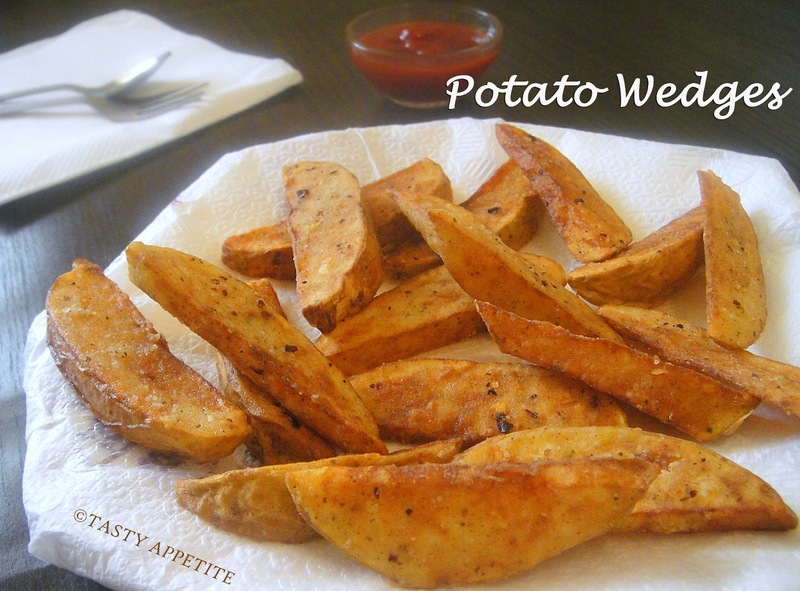 Potato Wedges are certainly a wonderful appetizer and makes a refreshing change from French Fries. 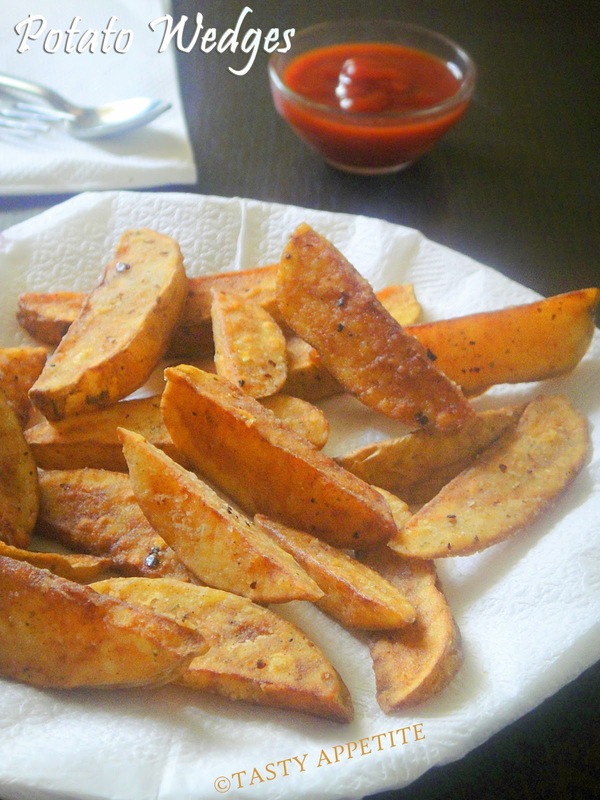 This crusty and delicious restaurant style Potato Wedges recipe is easy to prepare at home. I made these last week and they were excellent ! They had lots of spicy flavor ! 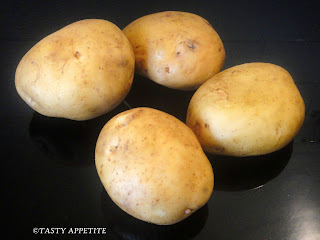 My kids loved them and they made a tasty crunchy side dish, along with our favorite burgers. Try this all-star, easy-to-follow simple recipe & enjoy..! 1. Wash potatoes very well and pat dry with a kitchen towel. 2. Slice them into half first, then slice each half lengthwise, into 4 equally sized wedges, so they cook uniformly. 3. Boil 3 to 4 cups of water in a pan until it is very hot. 4. 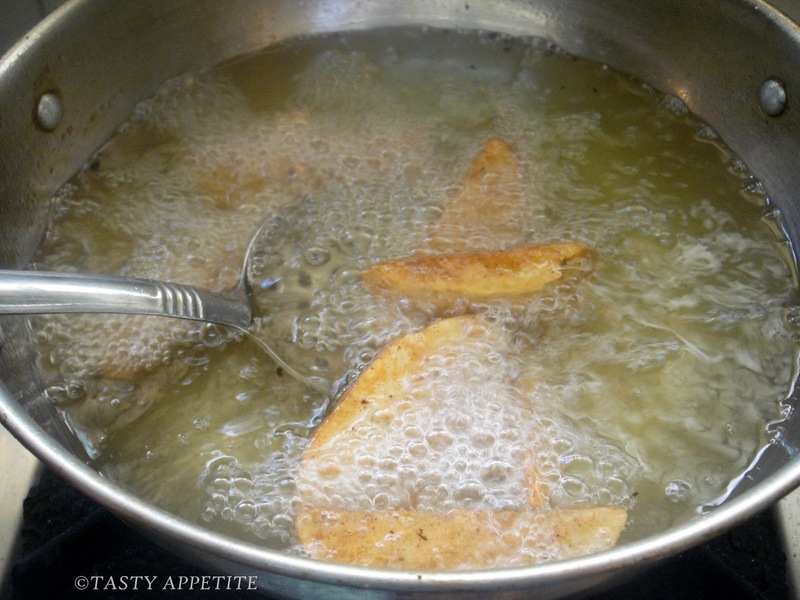 Add the potato slices & ½ tsp of salt to the hot water . 5. Cover and cook until the potatoes are three-fourth done. 6. 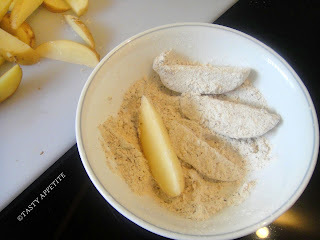 Meanwhile, lets prepare the flour mixture to coat the potato wedges. 7. In a bowl, take all purpose flour, red chilly flakes, dried mixed herbs (available at Indian stores), chat masala pwd and salt. 8. Mix it very well. 9. 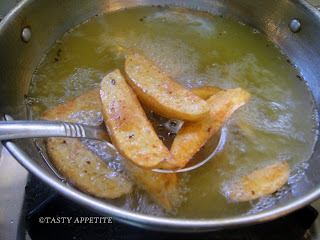 Now strain the ¾ th cooked potatoes from hot water using a strainer. 10. Drop it in a kitchen towel, allow to cool and pat it dry thoroughly. 11. Toss the pototo slices in the spicy flour mixture meticulously, to coat them evenly. 12. 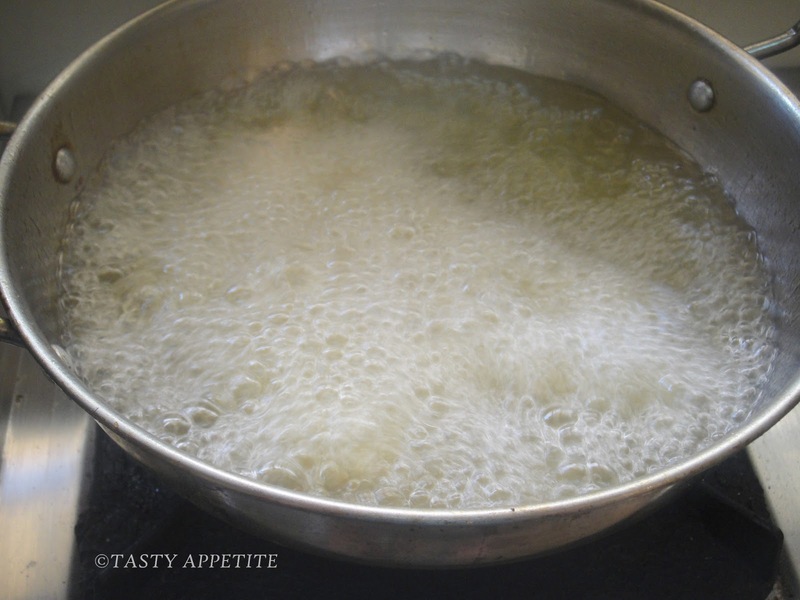 Heat oil in a fry pan. 14. Keep the flame in medium and stir once in a while. 15. Once the potato wedges are well browned, crusty edged and cooked tender, drain them in tissue paper. 16. 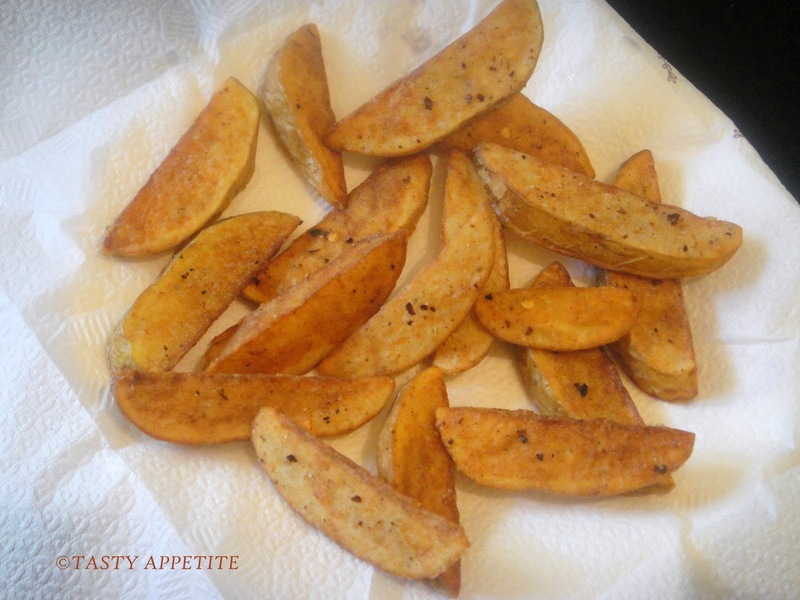 Yummy Potato Wedges are ready. 17. Serve immediately, sprinkled with little more salt & pepper pwd, if desired. when made perfectly like u have done, our house hold can finish kilos of this! Delicious evening snack, looks crunchy on the outside and soft on the inside..
Jay, this looks yum...would love to have with tomato sauce. Looks very tempting. Want to have a bite. Who says 'no' to potato? Perfect restaurant style. 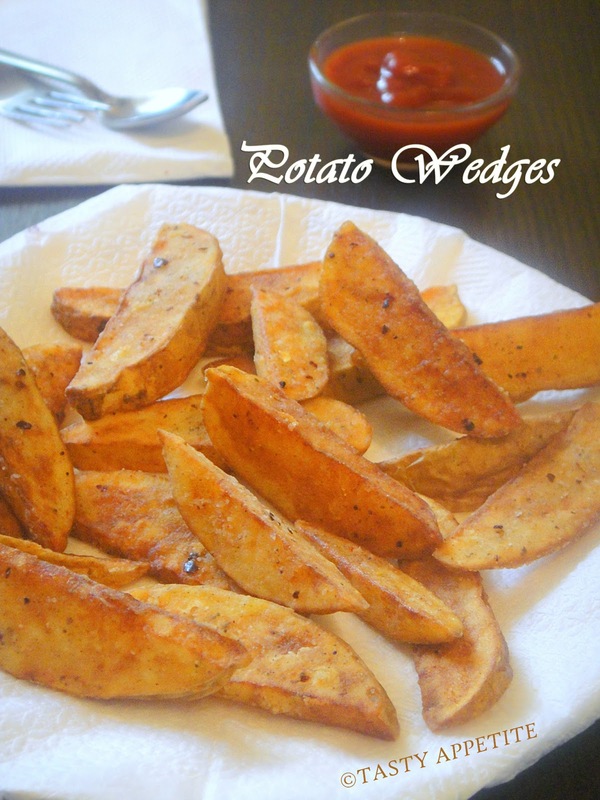 Wedges looks so tempting. Feel like finishing that whole plate, tempting potato wedges. Jay, I like this a lot! Will sure try it because I cannot resist potato wedges, yum! 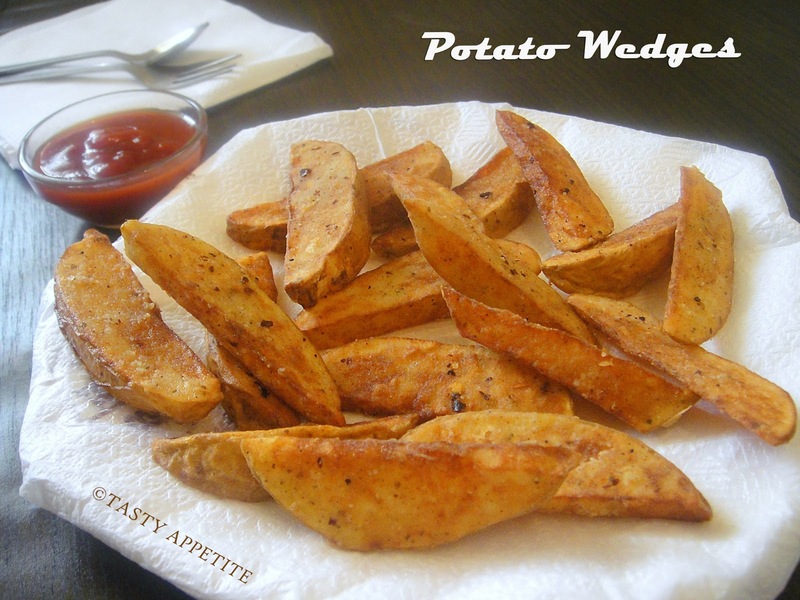 Mindblowing and mouthwatering potato wedges. Lovely snack! Nice colour! Anyone would want to gobble them! Hi Jay! 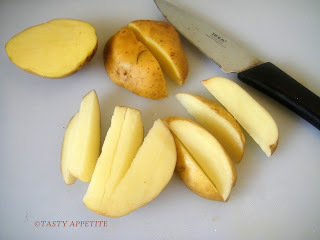 this potato wedges really look delicious for appertiser or snack. would love to try this soon. a perfect starter and a must have for parties!!! super tempting!! How nice home made restaurant style looking great and yummy. Thanks for sharing. A Crispy potato wedges Dear. Really a Lovely one.My fav too... Thanks for sharing. first time to your blog wonderful decription. i have question regarding this recpie that if i do the preparation till 11th step and keep it in fridge or deep freezer and fry it next day? 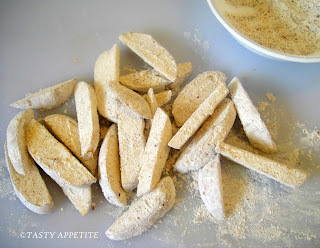 @ Meenakshi : Sure you can keep it in freezer and deep fry it the next day...it gives still more crunchier wedges.! 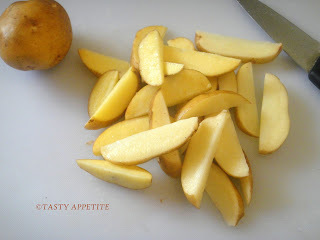 tasty, crispy & tempting snack.would like to try today surely. Thanks so much. 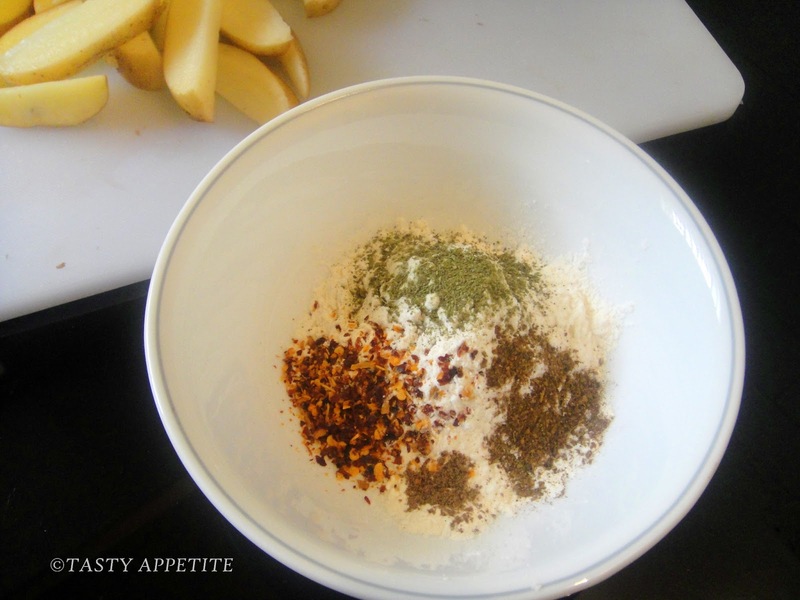 I didnt have the herb mix on hand and I added chilli powder instead of chilli flakes, but it turned out to taste exactly like the french fries u get at McDonalds! 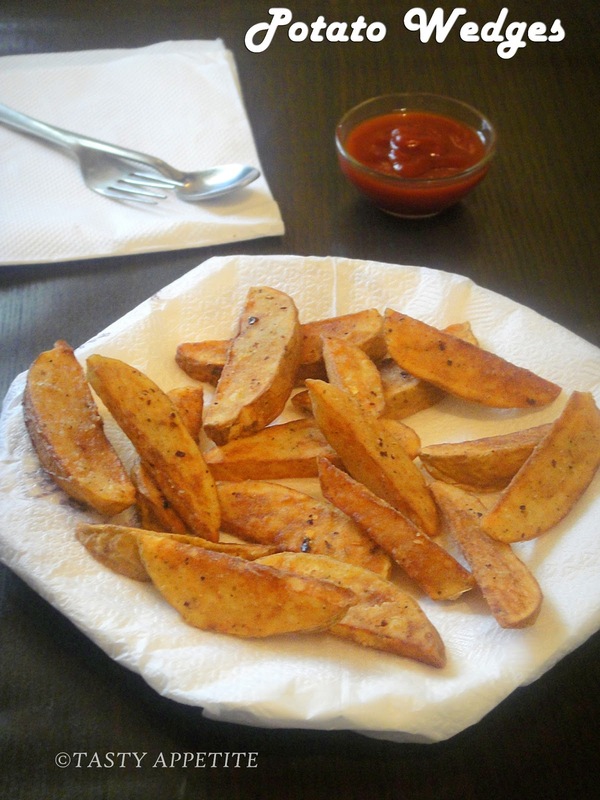 I think my first try at potato wedges was a success, all thanks to you!